A 15-year-old boy presented with history of coarse tremors of right hand and dysarthric speech since 1 year. Neurologic examination revealed Kayser-Fleischer ring More Detailss in both the eyes and dystonic tremor of the right hand. Serum ceruloplasmin and urine copper studies established the diagnosis of Wilson's disease. No evidence of jaundice or cirrhosis was seen to imply hepatic involvement. Liver function tests were within normal limits. 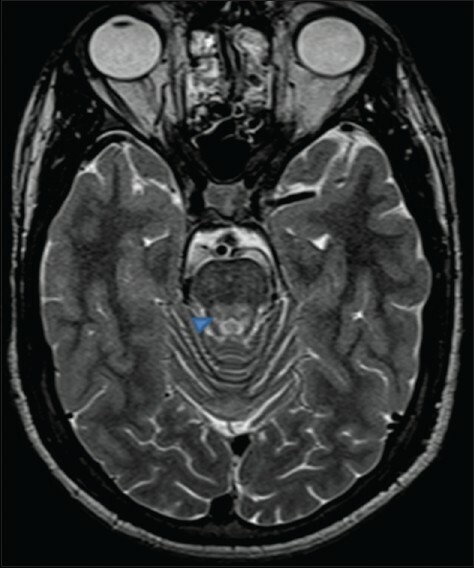 Magnetic resonance (MR) imaging showed T2 and FLAIR hyperintense lesions involving bilateral thalami, midbrain, and pons. The lesions were hypointense on T1-weighted sequence and showed no evidence of restricted diffusion. Only subtle hyperintense signal on T2/FLAIR images was seen in the lentiform nuclei [Figure 1]. Caudate nuclei, cerebellar white matter, centrum semiovale and subcortical white matter were not involved. Involvement of the midbrain demonstrated that the characteristic magnetic resonance imaging (MRI) appearance of the "face of the giant panda" and dorsal pontine signal abnormalities resembled the face of a cub [Figure 2] and [Figure 3]. Face of the giant panda and her cub constitute the "double panda sign"  which is characteristic for this disease and has been described only in few reports. 1. Jacobs DA, Markowitz CE, Liebeskind DS, Galetta SL. The double panda sign in Wilson's disease. Neurology 2003;61:969. 2. King AD, Walshe JM, Kendall BE, Chinn RJ, Paley MN, Wilkinson ID, et al. 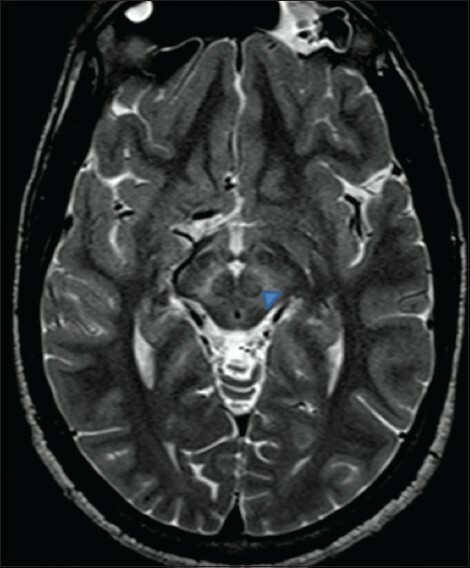 Cranial MR imaging in Wilson's disease. AJR Am J Roentgenol 1996;167:1579-84. 3. Harper C, Butterworth R. Nutritional deficiencies and metabolic disorders. In: Greenfield JG, Hume Adams J, Duchen LW, editors. Greenfield's Neuropathology. 5 th ed. London, UK: Edward Arnold; 1992. p. 838-40. 4. Kim TJ, Kim IO, Kim WS, Cheon JE, Moon SG, Kwon JW, et al. MR imaging of the brain in Wilson disease of childhood: Findings before and after treatment with clinical correlation. AJNR Am J Neuroradiol 2006; 27:1373-8. 5. 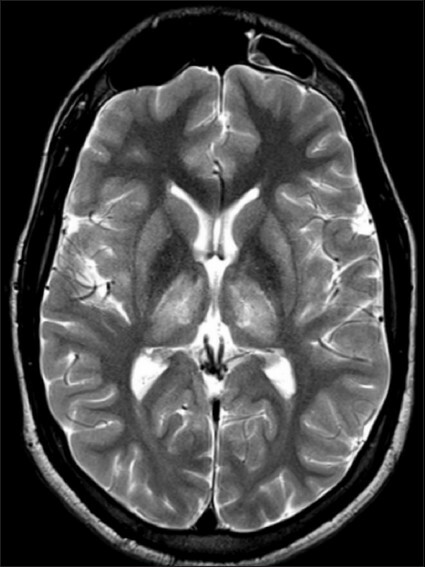 Hitoshi S, Iwata M, Yoshikawa K. Midbrain pathology of Wilson's disease: MRI analysis of three cases. J Neurol Neurosurg Psychiatry 1991; 54:624-6. Youn, J. and Kim, J.S. and Kim, H.-T. and Lee, J.-Y. and Lee, P.H. and Ki, C.-S. and Cho, J.W. Masciullo, M. and Mattogno, P.P. and Modoni, A. and Silvestri, G. and de Bonis, P.
Albrecht, P. and MÃ¼ller, A.-K. and Ringelstein, M. and Finis, D. and Geerling, G. and Cohn, E. and Aktas, O. and Hartung, H.-P. and Hefter, H. and Methner, A.
Kozic, D.B. and Semnic, R. and Petrovic, I. and Svetel, M. and Ostojic, J. and Kostic, V.S.